Barbecued Pork Tenderloin, easy gourmet dinner recipes. The herb garden is in full swing now. If you don't have your own garden you may not want to use as many. 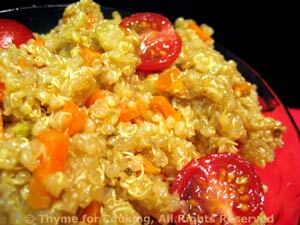 We're making extra quinoa for another salad later in the week. Try not to overcook pork; slightly pink on the inside is now acceptable and keeps the meat moist and succulent. Put some of the barbecue sauce in a separate bowl to be used for basting and discard or cook any leftover basting sauce. Mix paprika and garlic powder. Rub over pork. Put pork on barbecue or in 400F (200C) oven for 25 - 30 minutes. Turn occasionally to brown on all sides. 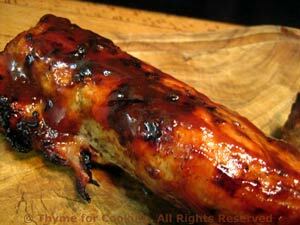 Baste pork with barbecue sauce after 15 minutes. Baste 2 - 3 times. When you think pork is done slice into middle to check. It should be done to an internal temp of 145F (62C). Remove, slice about 1/2" (1.5cm) thick and serve, drizzling with any remaining barbecue sauce. Heat all ingredients in a small saucepan, whisking to combine. Bring to a simmer just long enough to combine all ingredients. The thing I like best about Pilafs (other than the taste) is they are equally good hot, warm or cold, making them perfect for summer cooking, when we all want to be a bit more relaxed. Chop celery, carrots and onion. Heat oil in a small skillet and sauté onion, celery and carrots for 5 minutes. When quinoa is done, stir in sautéed vegetables. Spoon half into a bowl and serve, garnished with tomatoes. Refrigerate half of the Pilaf for the Salad. I have lemon thyme and lemon basil in my garden and love using it with courgette (and fish). 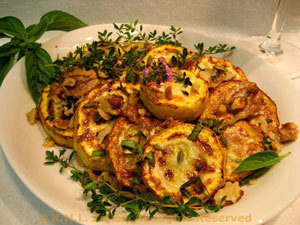 Use regular thyme and basil tossed with 1/4 tsp lemon juice as a substitute. Don't crowd the slices or they will steam, rather than fry... and won't get the lovely brown crust. Slice the blossom end off of the zucchini, then slice it into 1/2 inch (1 cm) rounds. Don't bother with the thin, stem end. (Slice as much as you'll want to eat; I did about 12 slices. Heat 1 tsp butter and the oil in a nonstick skillet over medium heat. The skillet needs to be large enough to hold all of the slices flat. Add zucchini slices and fry about 8 - 12 minutes. Check after 8 by lifting up with tongs and looking at the bottom; it should be getting brown spots on it. If not, fry some more; if yes turn and fry the other side. The other side won't take quite as long. While the zucchini is frying, heat the remaining tsp of butter in a small skillet over medium heat. Add walnut halves and sauté 10 minutes, turning and stirring occasionally. When done, transfer to a cutting board and roughly chop. Snip basil and pull the thyme leaves off the stems. When zucchini is done, remove to a platter, arranging nicely. Sprinkle with herbs, chopped nuts, salt and pepper if desired, and serve.